Last spring on one my first adventures by myself in the Bay Area, I discovered Poplar Beach, a jewel of a city park in Half Moon Bay. This has now become a favorite escape to the beach for me. Lots of FREE parking and during the week, it's easy to find a parking space, although on the weekends it is a bit more difficult - especially during the summer months. I love going here to just sit and enjoy the roar of the surf, the seabirds playing in the wind, pelicans diving in and out of the Pacific - doesn't matter to me if the sun shines or not. 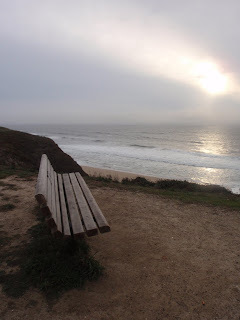 Lucky for me that there is a path that runs all along the bluff with benches scattered along the trail. On weekends you might not get lucky enough to find an empty bench, but this past Tuesday with high surf and roaring wind it was no challenge. 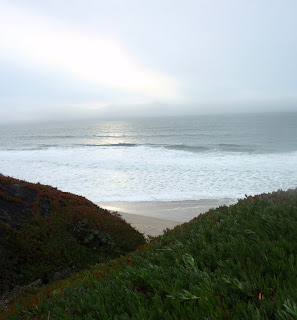 For me, there is something about a day on the coast that is NOT sunny, it is infinitely more interesting. 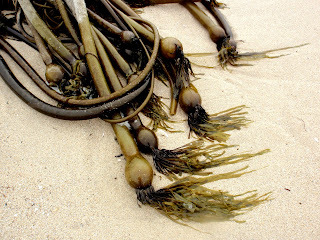 This was one of those days, pounding seas, roaring up the beach, tangling up kelp and tumbling shells and sea glass with almost a violent power. I wanted to laugh out loud with pure joy! If pelicans and seagulls could talk, I really do believe that they would exclaim their joy, as these must be favorite "play days" for them too. Days like this are not great shell collecting days, as it could be very dangerous to turn your back on the surf. For me, this is so difficult as I always want to stuff shells, tumbled beach glass and bits of flotsam in my pockets! Still managed to come home with just a small handful; am always fascinated by the different kinds of shells that I find in California. 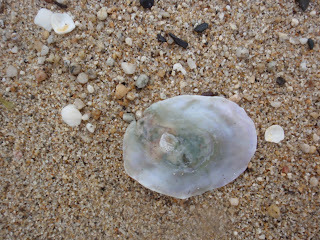 Look at how the sand and the power of the water have flattened out this oyster shell so that all that is left is the smooth gorgeous mother-of-pearl color, almost transparent in its' delicacy. Finally had to find the cliff trail back up to the top of the bluff, as my poor ears were freezing cold, and my fingers were like ice.. Your photos of Poplar Beach are gorgeous --- and completely different from the coast in my corner of the world. I also enjoy getting out "to play" and explore the beach when it is overcast. I've never heard it said better than "if pelicans and seagulls could talk I believe they would exclaim their joy" ... With added video you allow us to share in the joy. Thanks! and best wishes on your upcoming retail store.